I know you’re anxious to get to the good stuff like other dimensions and time travel, but you need to be patient just a little longer. After all, this blog is about what’s behind the science in science fiction, not the final result. Think of it as similar to those documentaries you see on TV which explain how they do the special effects in your favorite movies. I don’t know about you, but knowing how they do that makes me appreciate the movie even more. If you couldn’t care less, then you’re probably reading the wrong blog and need to just go back to reading sci-fi novels. Those who are left need to just bear with me a little longer as I explain the basics of atomic theory which is more relevant than you may think. Ready? Okay, here we go. As far back as 400 BC or so early Greek philosophers pondered what constituted matter and decided that it could only be divided down so far, from which atomic theory was born. 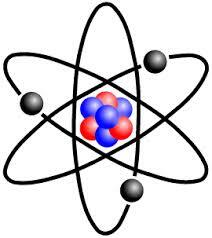 The term “atom” even originated with their adjective atomos, which means indivisible. Back then the elements were believed to be water, air, earth and fire. Clearly they are all important, particularly to life, but not a one of them is an actual element in the chemical sense. However, proving it was another story and it wasn’t until the 18th – 19th century that scientists gradually discovered that water was comprised of hydrogen and oxygen; air is mostly nitrogen with hydrogen, oxygen and various others in the mix; earth is made up of too many elements to count; and fire is a process that involves oxygen and thus called oxidation but isn’t an element in and of itself. As they confirmed that certain chemicals could only be broken down so far the Periodic Table of the Elements was born. Periodically more are added (pun intended) though in most cases they are manmade. By the early 20th century experiments involving electromagnetism and radioactivity revealed that, would the truth be known, the atom was not indivisible after all, but consisted of other particles which were identified as protons, neutrons and electrons. These were suitably dubbed subatomic or elementary particles and scientists conveniently ignored the fact that the etymology of the word “atom” no longer applied, figuring most people didn’t know Greek, anyway. How these subatomic particles were arranged was a matter of debate that went through numerous speculations. J. J. Thomson’s idea was sometimes referred to the “plum pudding” model where protons and electrons were lumped together in a glob of positively charged fluid. After that, Ernest Rutherford decided that the positive charge as well as most of the mass were concentrated in the center with the electrons surrounding it in some unknown way. In 1913 Danish physicist, Niels Bohr, proposed his version of the hydrogen atom which remains the mental image many retain today, i.e., a nucleus in the center with electrons revolving around it much as the planets orbit the Sun as shown at the beginning of this blog. Bohr still believed that electrons orbited the nucleus but he placed restrictions on them to certain discrete distances or allowed orbits so that it would agree with what experiments thus far had revealed. At this point they considered the electrons to be itty-bitty particles that orbited the nucleus according to the laws of classical mechanics, in other words like the planets orbit the Sun. The electrons would change orbits based on either emitting or absorbing a photon, as shown in the animation. This was getting closer, but still had problems. Nonetheless, the idea of specific orbits was a definite step toward quantum theory and the fact that only specific energy states were allowed. The real problem was thinking of electrons as tiny specks of matter which behaved according to Newton’s Laws pertaining to gravitation. WRONG! In 1924 a scientist named Louis de Broglie (pronounced de-broy) proposed that all moving particles could exhibit wave-like behavior. Erwin Schrodinger liked this idea and developed it further, into a probability wave. This theory helped explain behaviors that previous ones couldn’t but still didn’t cover everything. This was ultimately solved by Max Born (no relation to Jason Bourne) who theorized that Schrodinger’s equation represented all possible positions where the electron might possibly be. This conveniently reconciled the two ideas and the wave/particle duality of electrons was born (pun intended). However, trying to figure out the atom was not taking place in the proverbial vacuum (though admittedly some experiments were). During this same time numerous other scientists were hard at work investigating what interested them most and ultimately led to so many different scientific disciplines. Things were getting too complicated for any one person to have a firm grip on everything anymore. Light was also under scrutiny since it was apparent that atoms and electromagnetic radiation (a.k.a. light) were related. If you’re scratching your head on where that came from, it derived from having established that atoms emit a photon when they change states, like that cute little animation shows. And in case you’re wondering, yes, even the Sun, our greatest source of energy and light, is no more than a giant glob comprised mostly of hydrogen atoms which bond with each other under pressure to become helium at which time a photon is emitted. Lots of them, true, but that’s the process. Simple. Most people think of light as what we can see which is conveniently broken down into its various colors by a prism or in some cases a rainstorm that occurs when the Sun is out and thus produces a rainbow. 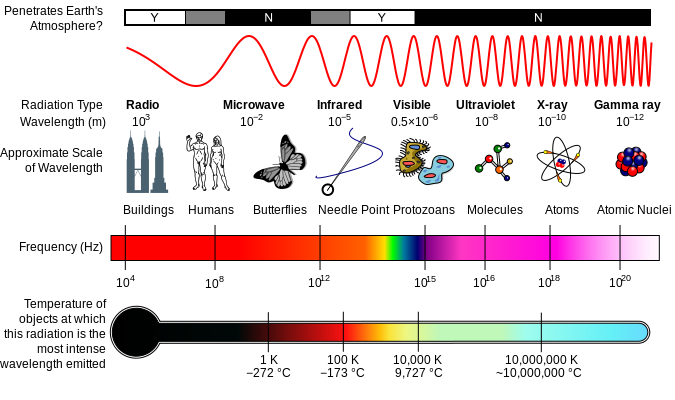 Visible light, however, is but one small portion of what is known as the “Electromagnetic Spectrum.” It also includes various other wavelengths that span a vast variety of wavelengths and energies ranging from radio waves and infrared (heat) on one side to ultraviolet, x-ray and gamma radiation on the other. In the picture you can see the rather small portion of visible light in the middle where it looks like a rainbow. Albert Einstein theorized that similar to matter, light could also only be broken down so far, the smallest unit of which was ultimately called a photon. He even proved it and received the Nobel Prize for his paper on the photoelectric effect, which stated that a photon could change an atom’s energy state and that principle is used widely today with all those automatic doors you encounter everywhere from the grocery store to Wal*Mart. Physicists conducted numerous experiments with light which revealed that it, too, had both wave and particle characteristics. Since photons originate with atoms the fact that they share some of the same characteristics shouldn’t be any more surprising than the fact your have your father’s nose or your mother’s smile. True, photons are massless, but electrons aren’t. Nonetheless, they also show wave and particle traits. This is a good place to ponder Einstein’s famous equation, E=MC2, which states energy is equal to mass times the square of the speed of light. If you rearrange it algebraically you have energy divided by the square of the speed of light is equal to mass, which essentially declares that mass and energy are the same thing. Now we’re getting into the good stuff. So give that some thought until next time when I introduce you to the true beginnings of weird science which originated with something called the double-slit experiment. This entry was posted in Physics Explained and tagged Albert Einstein, atomic theory, Bohr, chemistry, de Broglie, E=mc2, Einstein, electrons, elementary particles, Ernest Rutherford, Erwin Schrodinger, Greek philosophers, hydrogen atom, light, Louis de Broglie, Max Born, Niels Bohr, periodic table of the elements, photons, physics, physics for dummies, Rutherford, science, science and science fiction, science fiction, science in science fiction, spectrum, subatomic particles, visible light, wave-particle duality by Marcha's Two-Cents Worth. Bookmark the permalink.